Deciding which color layer comes next is a very serious decision for printmakers. Especially those of us who create using the reduction method. In the past, I have used test sheets on less expensive paper, or the reverse sides of spoiled prints, to make my color decisions.Each of these strategies has a problem. Less expensive paper can cause ink to behave very differently — often sitting on top of the surface rather than being incorporated into the paper. Further layers don’t print the same way as on my good Rives BFK. The reverse side of the spoiled prints have a particular texture which actually interferes with the next inking of the block and creates problems for the actual edition. My latest linocut has nine color layers, so accuracy has been important. I now print color strips as I go along to help me. I save the long narrow pieces of paper that remain when you tear down paper for an edition. I use a similarly sized piece of linoleum for my test block. 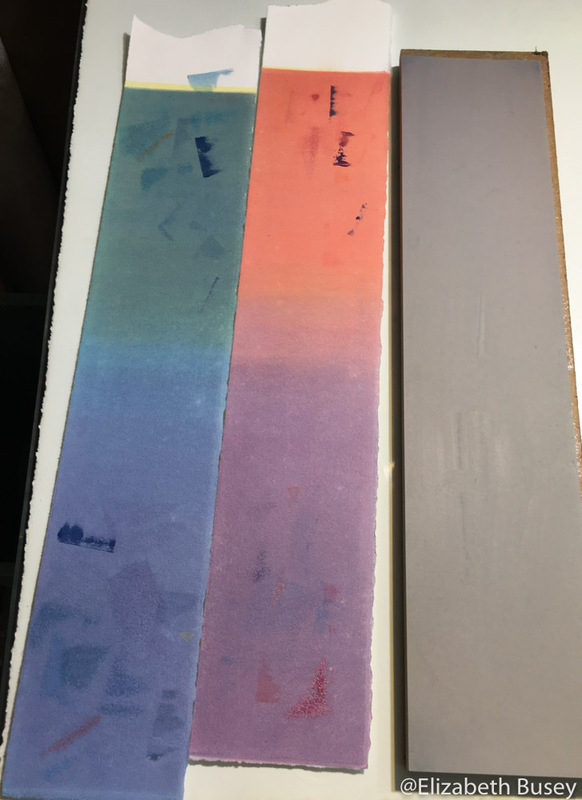 My color test strips for recent linocuts have nine layers of ink, and evidence of lots of testing. After I print the first layer of ink on an edition, I ink the lino scrap the same way as my block and print it onto my scrap paper. I leave a bit of white paper at the top so I can hang the scrap paper with the edition to dry. When I am deciding on the next color, I use my palette knife to “draw down” some of the color over my first printing layer. I keep in mind that the layer using the knife will be a bit darker than when it is actually printed. When I’ve decided on a color, I can wipe off these draw downs. Pandora’s Paradise. Reduction linocut on Rives BFK. 12 x 12 in (image size) Edition of 12, $300. Occasionally I have a color that isn’t exactly what I expected, but as we know from color theory, how it appears will change with the next color. I just remember to print each new color on my color strip, and eventually I find my way. 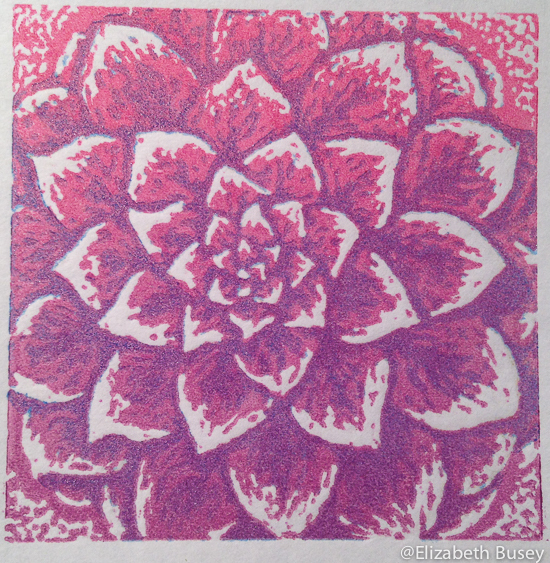 This entry was posted in Color Theory, Inspiration and tagged colors, draw down, layers, linoleum, Pandora's Paradise, test, transparent, transparent ink on March 11, 2018 by Elizabeth Busey. In a memorable scene from the movie Shrek, Shrek is trying to describe ogres to his traveling companion, Donkey. “Ogres are like onions…they have layers!” he exclaims. 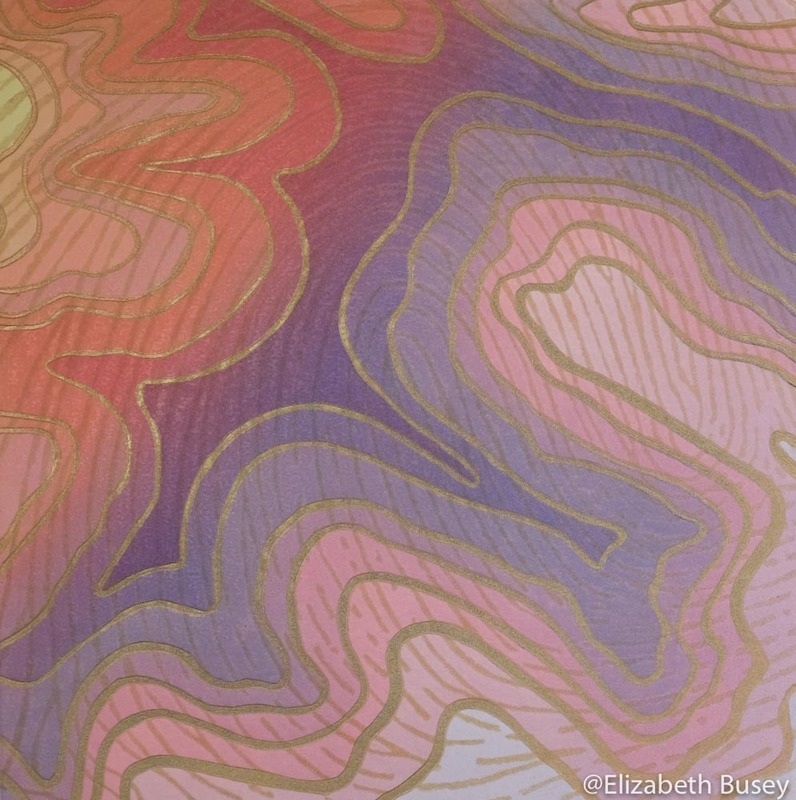 They are complicated, nuanced… Layers are also the secret behind printmaking. As I detailed in my last post, most of my prints have eight to ten layers of transparent ink to create an image that “pops” out from the paper. Linoleum Reduction Print, 25 x 17in, 2012. 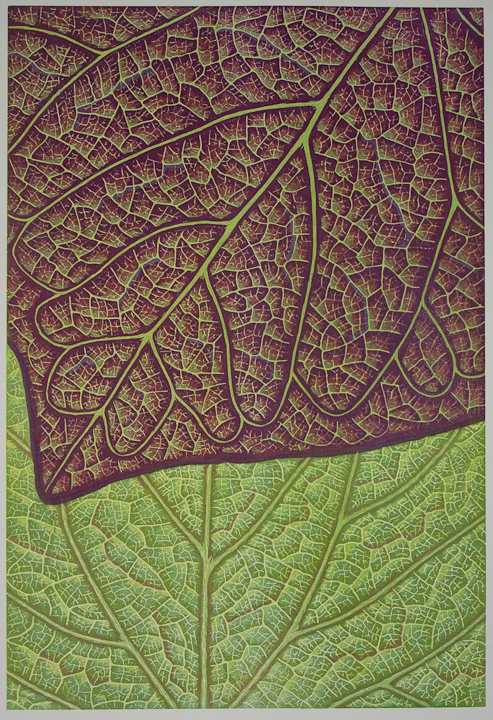 My latest print, Breath Intertwined, has many layers, and different parts of the print have different layers. By making use of some cardboard masks, I was able to use thalo blues in the lower green part of the print. The purple-red leaf section received several layers of outrageously electric purple to achieve the dusky red-purple of the finished leaf. Last night I explained to my art group friends that even though different parts of the prints had different layers, it was necessary for them to share some layers as well. 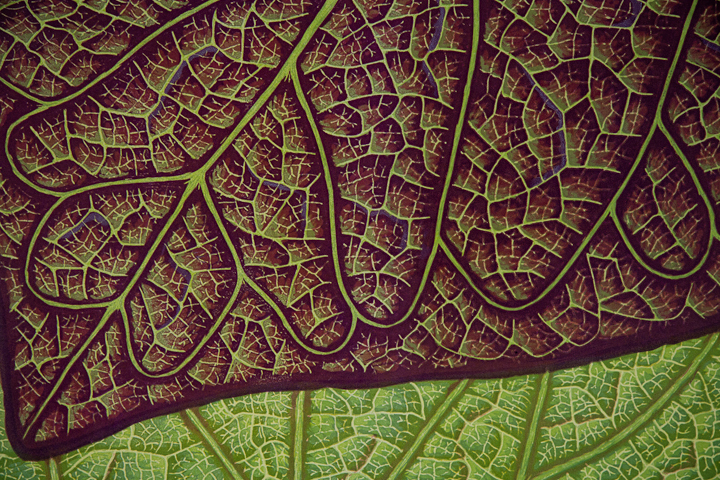 In the case of the two leaves, they share several layers, yielding the bold chartreuse color of their veins. This shared color palette helps the image feel connected and harmonious. Can you see the chlorophyll? It is all about the layers. 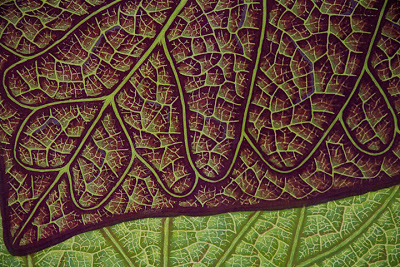 Even leaves that block the green light from our eyes have the chlorophyll necessary for photosynthesis. I imagine that they have the layers of green in them, but we just can’t see them. We just have to have faith (or confidence) that it is there. 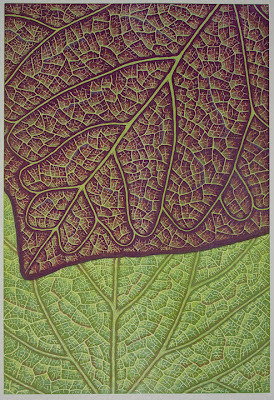 This entry was posted in Botanicals, Color Theory, Reduction and tagged layers, leaves, Linocut, linoleum, ogres, onions, photosynthesis, redbud, relief printmaking, Shrek, transparent ink on September 27, 2012 by Elizabeth Busey.